“Oh! 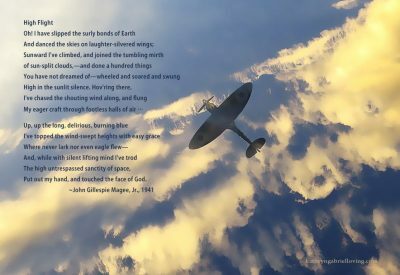 I have slipped the surly bonds of Earth … put out my hand and touched the face of God.” These lines from John Gillespie Magee’s 1941 poem, “High Flight,” have inspired generations of aviators. Written from the perspective of an aircraft at 30,000 feet, we can understand the spiritual intent. At a deeper level, the sonnet is an exclamation point to a teenager’s struggle for freedom after being marooned in America, away from his beloved England. It is the song of a soul’s escape from the heavy burdens of life to soar the skies with nothing less than joy. My novel, A Day in Eternity, explores John Magee’s struggles and joys he expressed in some 100 letters and nearly two dozen poems penned over the final four years of his life. When seen in the scope of John’s entire body of work, “High Flight” takes on new meaning. John Magee’s exile in the United States began later in 1939 when he was restricted by the U.S. State Department from travel at the onset of Great Britain’s war against Germany. He was devastated. He had gone to America at the request of his father to reacquaint himself with the paternal half of his heritage, having been raised mostly in England. Even when travel reopened, his passport was canceled. Just seventeen at the time, he was compelled to complete his high school education in Connecticut. I have been under a sort of emotional stress ever since the war began…. I am so longing to get back to help out. Don’t you believe a man should live by his convictions? I am convinced my place is in England, and if ever I see the opportunity, I’m coming. …Something in me is dying, irrevocably, irretrievably; I am beginning simply to exist whereas before, at any rate at moments, I lived. …I realize, deep down, that I have had my fill of it, yet there is a sort of futility in trying to escape from the demands of its existence. To get away from it all, to walk again on the beach at Kingsdown, and feel the freshening wind on one’s face, and wonder, perhaps, if there are any chocolate biscuits left for tea! There was an ecstasy there, and I was damned (in every sense of the word) into overlooking it in all my blindness. I was introduced to Bertrand Russell’s Why I Am Not a Christian, to Georg Brandes’s Jesus, a Myth, and to Lucretius’s De Rerum Natura. I began to see that the Christian faith had undergone a metamorphosis since Christ began it. I became concerned with whether reason and faith could coexist. I saw that there was something defeatist about casting your problems upon the deity as things being too profound for human solution. I did not particularly want to find peace of God, for peace and contentment are death according to Goethe. Then I met Emerson who wrote: ‘Within man is the soul of the whole; the wise silence; the universal beauty, to which every part and particle is equally related, the eternal ONE.’ And I saw how Socrates went to his death in the calm and absolute belief of a life to come. If Socrates, the wisest of all philosophers, believed in an afterlife, then I would deem myself foolish to believe otherwise. In September, 1940, he was poised to enter Yale on scholarship, but he instead enlisted in the Royal Canadian Air Force as a means of returning to England. Because of the backlog of recruits, it would still be a grueling four months before he would start basic training, and then he would undergo a further five months of flight and aerial combat training. Once he received his wings and commission as a pilot officer, he was further delayed by a month-long naval convoy across the Atlantic with a two-week layover in Iceland. John’s yearning to reunite with England does not mean that he was the proverbial Sad Sack. When he learned to fly, he did so with abandon. On his second solo flight, he put his Fleet Flinch into a spin to experience the thrill of imminent death and recovery. In doing so he triggered an inverted spin and lost consciousness before reawakening and finally pulling out of it. His instructor watched the whole event from the ground and treated him to a couple more spins to allay any phobias he might develop. John engaged fellow students in fake dogfights and even chased after aircraft from other air bases. Prone to mishaps, he cartwheeled a Harvard trainer on the runway after misjudging his proximity to the ground in the dark. Instructors always threatened to wash him out, or at the very least write him up so that he wouldn’t become anything more than a sergeant, but he consistently scored near the top of his class on exams. The RCAF was obligated to advance its brightest pilots, and those who took chances were especially needed at the front. While at Llandow, he learned how to handle the Spitfire in formation flying, learned to excel in combat maneuvers, learned to shoot at the enemy on his tail, learned to shoot his camera guns at a moving target while avoiding getting hit. He pushed the limits of the Spitfire’s capabilities as well as his own, staying airborne as long as he had the fuel. He’d been to 20,000 feet where oxygen was needed for dog-fighting practice, but his mind was so focused on the exercises that he couldn’t fully appreciate the heights. In rare moments he managed to escape the group and fly off on his own. “I felt like Icarus about to singe his wings,” he wrote his parents. … Now he was suddenly caught by the way the sun’s rays shattered on his bubble-top canopy, and how the clouds created cathedral-like vaults across the azure sky. … Looping, rolling, diving, and turning within the lower reaches of earth’s stratosphere at speeds of more than 350 miles per hour made his heart pump adrenalin throughout his body. The pulling of G-forces caused his mind to dislocate, and he felt his own consciousness project outside of himself. At once he sensed a protected closeness to what he could only describe as a benevolent power. The sensation stunned him, and he marveled at the wonder of his expanded universe. He was Icarus who escaped the Labyrinth prison on make-shift wings and flew precariously close to the sun. He knew with certainty that he’d been given the gift of life so that he could discover this secret. All of the God I knew. And sang my praise with them. John figured that only a few hundred men, if that many, had ever experienced the jubilation of flying alone at such an altitude. Fewer still had experienced the truth that God was not limited to church or temple, he thought. God did not belong to any one religion, God could not even be contained on the planet below him. God was a power that was everywhere! John Magee, via the Supermarine Spitfire, was but a citizen of this celestial city where he could indeed explore and dance the streets of heaven. He felt indebted to Hicks for having shown him this truth, but the poem didn’t go far enough in describing the ecstasy he had experienced. Upon landing he performed his post-flight duties as quickly as he could, then he rushed back to his bunk and searched for any scrap of paper on which he could fill in the lyrics to the iambic-pentameter rhythm beating like a heart within his most inner being. He began with his favorite line of the Hicks poem— “touched the face of God.” This would be the crowning jewel of his sonnet, but he needed to show how he had rocketed to the pinnacle of his mind and then transcended it to enter the rarefied strata of divinity. Other poets in the Icarus anthology provided further lines of inspiration: “on laughter-silvered wings,” “the lifting mind,” “the shouting of the air,” and “across the unpierced sanctity of space.” His finished creation would not be entirely original, but he didn’t think that mattered. What mattered was preserving the euphoria he’d experienced tens of thousands of feet above the earth so that he could remember it when he descended to the depths of combat hell. The Two Faces of John Gellespie Magee, Jr.
John Magee was two people. The first persona was that of a sensitive poet pre-occupied with death and the second a rabble-rousing adrenaline junkie. His poem, “High Flight,” reconciles his spiritual-intelectual curiosity with his tendency to push the limits of physics. He was a genius at both. The John Gillespie Magee, Jr.,materials are archived in the John G. Magee Family Papers, Record Group No. 242, Special Collections, Yale Divinity School Library. “Brave New World,” The Complete Works of John Magee, The Pilot Poet, including a short biography by Stephen Garnett. Cheltenham, Gloucestershire: This England Books, March 1989. A Day in Eternity, Kathryn Gabriel Loving, SoulJourn Books, 2016. This excerpt in the novel peices together quotes from John Magee’s letters and extrapolations from what he said he had read. Icarus: An Anthology of the Poetry of Flight by R de la Bere (Macmillan, London, 1938), contains the poem, “The Blind Man Flies,” by Cuthbert Hicks. 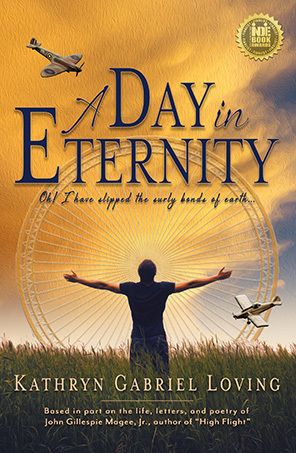 A Day in Eternity is currently available in all formats on Amazon, Barnes & Noble, Apple, and most places where ebooks and print books are sold. Brilliant. I’ve been asked to read High Flight at a commemoration service on 19th August exactly 50 years on from a tragic mid-air collision over the town of Holt in North Norfolk, England. That stormy evening a Victor bomber from RAF Marham collided with a Canberra based at RAF Bruggen in Germany. All seven aircrew died and the aircraft scattered remnants over the town, woods and fields. On the ground no one was harmed and very little damage done. It became known as the miracle of Holt. your words have greatly aided my preparation for the reading . Many thanks. Thank you for dropping a note. I’ve noticed that High Flight is being read at many of the RAF centennial events. How is it that you were asked to read it? My Uncle James D Barbour was from his squadron and is buried beside him. My Dad who was also RCAF was ground duty but always talked about Uncle Jim like he was still alive. Thank you for your comment. How did James die? He may be listed in my research. High Flight is the most evocative and joyous poem I have read. Three weeks before war was declared in 1939, my father who had previously joined RAFV at Whittering in Northamptonshire was called up and served as one of the first to train as a radar operative with Air Sea Rescue. He was posted to go with the D Day landings but retained in UK for North Sea duties. He was demobbed on VJ Day. High Flight speaks to me as no other poem has done and is a deeply poignant memorial to all those very young and very courageous aircrew who flew out from Uk and did not return. RIP. Thank you for sharing your story, Val. Thank you also for your father’s service.